All of the quarreling, complaining and posturing is over. Sergey Kovalev wants another shot at Andre Ward, and he’s going to get it. Ward, tired of hearing Kovalev’s complaining, now simply wants to shut the “Krusher” up for good. The disdain the two men have for one another is real, with Ward getting more and more agitated each time Sergey or someone from his camp drops another “crybaby” quote. 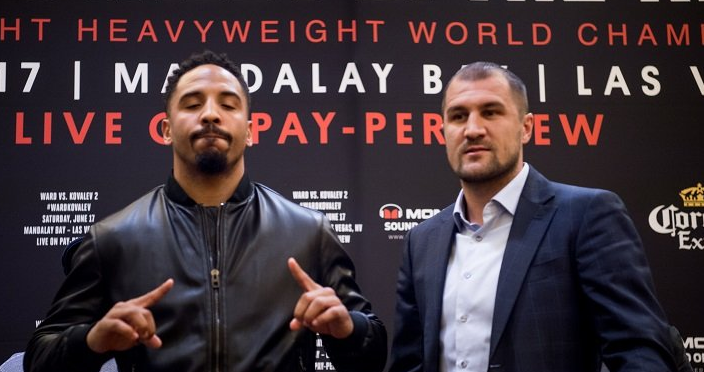 Ward says he’s grown tired of Kovalev complaining about being robbed of his belts last November when three American judges scored a close fight in Ward’s favor. Add in the numerous verbal jabs he’s thrown Ward’s way leading up to the rematch, and mutual respect has now turned hatred and disdain from both men. Ward sat down with Thacover2.com to discuss the rematch with Kovalev, managing Shakur Stevenson, and where he ranks on the Pound for Pound list. How has training camp gone for you this go round? Man it’s been great, high intensity, working on some new things. Kovalev definitely won’t see the same fighter in this fight, and Virgil has me prepared to utilize several plans or any plan that needs to be implemented at any given time. How are you mentally approaching this training camp, albeit a rematch, as compared to other huge bouts? I’vv found plenty of reasons to get motivated, to get up in the morning and put my body through what we put our bodies through. I have many great motivations to keep going and achieving, but when a person talks and says certain things like he says, you’ve got to take note of it and you’ve got to use it on fight night. With Kovalev threatening to end your career and spewing insults, do you believe he’s coming off a bit desperate? The one thing I’ve noticed different about him since the fight ended is just the lack of mental toughness that this guy has. All the excuse making and all the things he’s been saying since the last fight, those are some deeper issues. That’s honestly a weakness I didn’t know he had, and I plan to to take advantage of it. Kovalev tries to have a bully mentality, but it's really a façade and that reputation is a facade as well. He didn’t do what he said he was going to do. I don’t some of the things this guy stands for, I don’t respect how he’s handled himself, and I don’t condone it. I honestly wouldn’t even call it animosity. It’s just a disdain. Do you believe you are the top pound-for-pound fighter in the game? When it comes to where the experts view me when it comes to the best pound-for-pound fighter, I leave it to those who have a say. For me man, I know where I stand, I know what I’ve accomplished in this sport and how I stack up against today’s elite fighters. I also know that I don’t have a vote, so I’ll leave it to those who do. If they have me at the top, I’m thankful. If not, I’m going to just keep working. With everything going on in politics, are you buying into the whole USA vs Russia aspect of this fight? I’m honored to represent my country which I’ve done since I’ve been fortunate enough to do as a little boy at the Junior Olympic level all the way up to the Olympics. I’ve had a lot of international competition as a professional and it’s an honor and a privilege to live here in the United States and to represent my country. And I’ve always tried to do that, no matter who I’m fighting. What about Shakur Stevenson intrigued you enough to become his manager? The training piece—we talk about that kind of stuff, but it’s also more life. It’s about being stable, and making the right decisions now, so down the road you’re happy that you did what you had to do. Any thoughts on GGG vs Canelo, and would he need to move up in weight to face you? The only question or thoughts I have is whether GGG is simply too big for Canelo. That’s my biggest question on the fight. I think it’s a great fight. De La Hoya and Canelo did the right thing allowing the fight to be built. They didn’t allow media pressure, media scrutiny to force them to get in there before they wanted to. They allowed Canelo to come up in weight and let his body get settled at a higher weight and make a few paydays along the way. Now it’s something people are talking about and it’s a big fight. Is it safe to say that you’ve won over all your detractors? I don’t know, that’s for the critics—you guys to talk about. There have been naysayers my whole career man, and if I shut him out the entire fight, there would be naysayers. When I make a certain amount of money, people get mad at that. I stopped trying to prove naysayers wrong years ago to be honest with you, I don’t even use that as motivation anymore. In this sport you’ll have chronic haters, chronic naysayers, who spend year-round nitpicking. So I’m good either way.